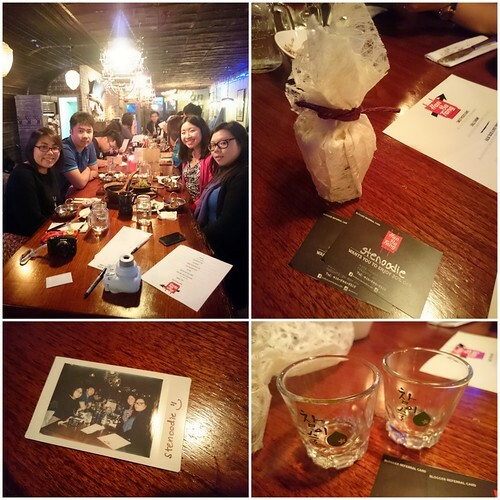 When I first received the invitation e-mail from Acorn Communications regarding this Blogger Media Preview Event at Han Ba Tang, I absolutely didn’t expect it to be so smoothly organized and cater to the bloggers so well with such delicious food. 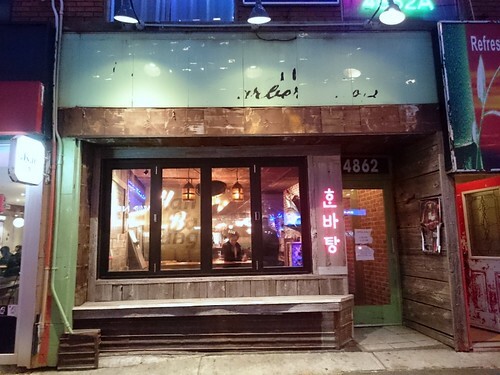 It is very considerate of the owner to host this event for two nights for Toronto’s eminent bloggers to try out this new Korean fusion tapas restaurant. I felt very honoured and excited to be part of this event! On Sunday, November 30 at 5 p.m., I arrived at Han Ba Tang. 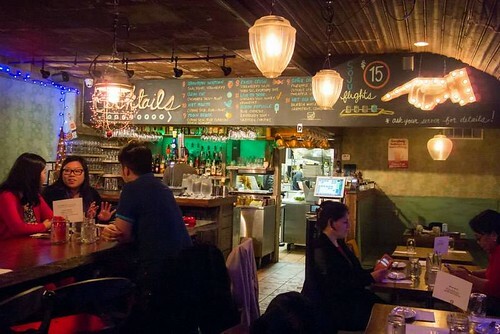 This quaint restaurant is located in the busy area of Yonge and Sheppard in North York, Toronto. If you are taking the public transit, you can easily walk for a minute from the closest subway station to the restaurant. If not, there is parking easily accessible from the back. Han Ba Tang does not have a sign on its front proclaiming its name. 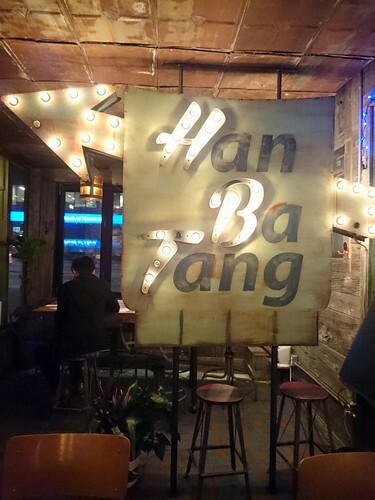 Rather, the name “Han Ba Tang” is located as a big sign with the letters “HBT” lighted up in the inside of the restaurant. “Han Ba Tang” means “one full round”. While I waited for my friends to arrive, I noticed that the other bloggers were walking around taking pictures of everything so I made sure I did so too. 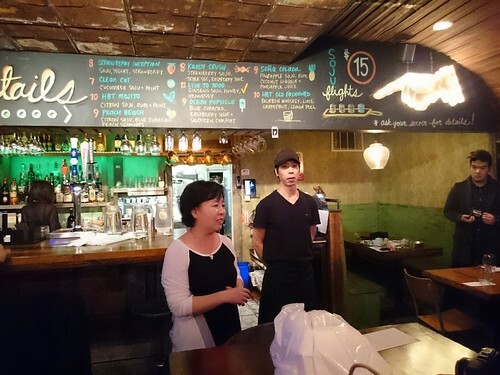 The place is really nicely decorated with a cool and modern vibe. 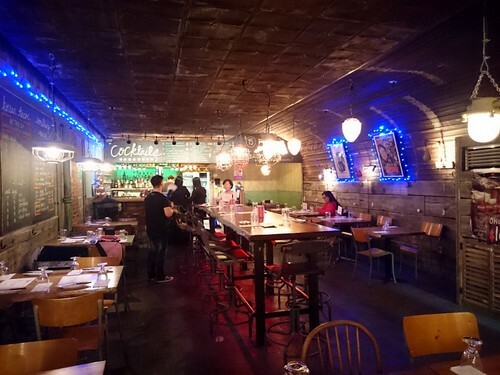 As we found out later, the place maintains its interior look since World War II with the brick showing yet brings a modern vibe with the lights and decor. 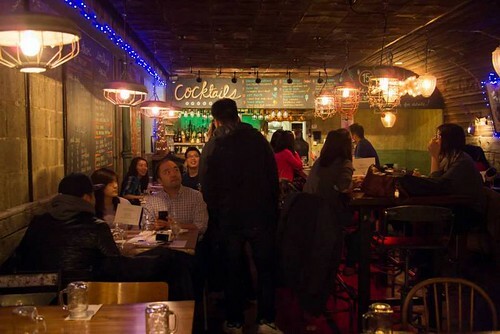 It is a casual restaurant that could double as a bar considering that they serve many cocktails. The friendly servers walking around informed us that we could take a look at the cocktails on the chalkboard and order one for the night. There were a lot of infused soju cocktails that all sounded delicious. 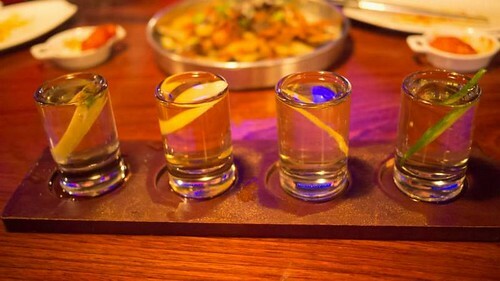 They even had soju flights! Jars from whence the soju flights came from. 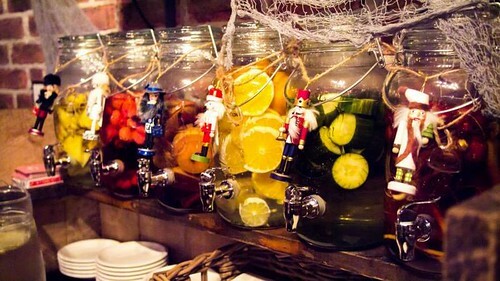 They are so decorative! 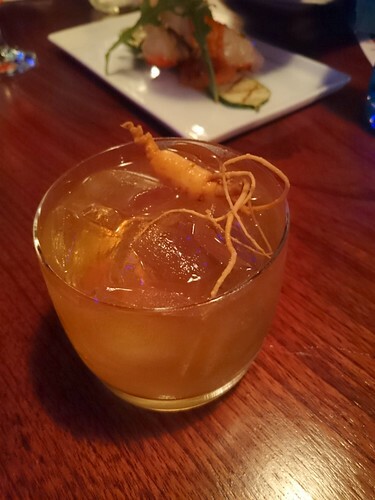 I ordered the “Live to 1000” Ginseng Soju cocktail. The drink actually came with a piece of ginseng and it tasted so good! You could definitely taste both the fresh ginseng and the sweetness of the honey. This was my favourite drink after trying the cocktails that my friends got. Jessica’s “Strawberry Inception” contained soju, yogurt, and strawberry and tasted exactly what it contained. It was sweet and quite good. Matt’s “Peach Beach” was a cool blue colour and tasted like the beach to me instead of peachy. It was an interesting drink! Shortly after we were served our drinks and the room was filled up with more bloggers and their guests (I loved how each blogger could bring up to 4 guests including him/herself. This was so generous of the restaurant!). The owner is Chae, a Korean lady who is very pleasant and sweet. 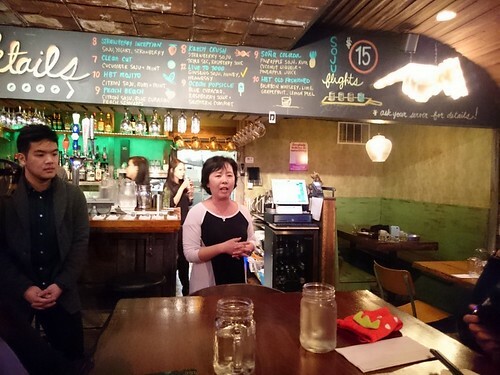 You could tell from her speech about how she started the restaurant and the background story that this restaurant was her passion and she was dedicated to improving herself and the restaurant to be the very best. That was why she was so happy to have so many food bloggers in the room to give her feedback on her restaurant. You couldn’t help but be pleased and happy for her and her restaurant. She is so likable! 🙂 I also appreciated how she ended off her speech by informing us that the event would last until 7:30 p.m. This was great to know for those who had to leave early or wanted to know how the night would carry. On our table, there was a menu of the food that we were going to receive that night. 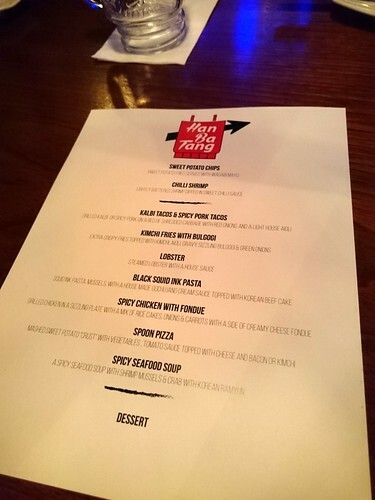 I was so excited about it all because a glance at the menu indicated that not only was the food going to be unique and inspiring, but the number of dishes was sure going to leave a taste tester happy. There were over 10 courses of food and drink! Before each course of food was served, the owner gave a little introduction of the food and its price that she planned to serve the food for. 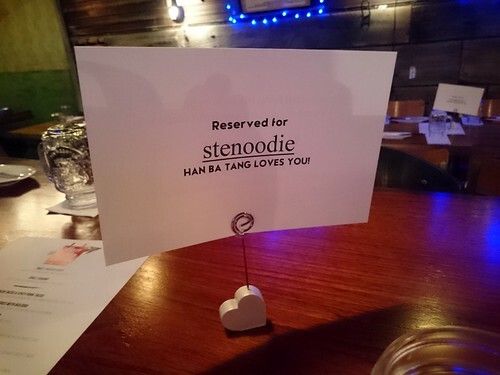 Han Ba Tang is a Korean fusion tapas restaurant so everything was nicely portioned to share. First up, we had the Lobster, Steamed Lobster with House Sauce. It was very nicely presented. The lobster tail was split up and house sauce was drizzled over the plate. Other than the delectable house sauce that was not too heavy or light, the lobster itself was average. For the price of what a lobster would cost, we believed that serving this dish on seasonal occasions would probably be best. 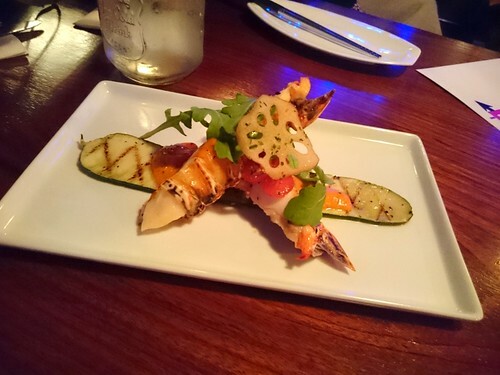 In any case, I still enjoyed this dish because I really love lobster. 🙂 Especially when the lobster meat is chunky and substantial! 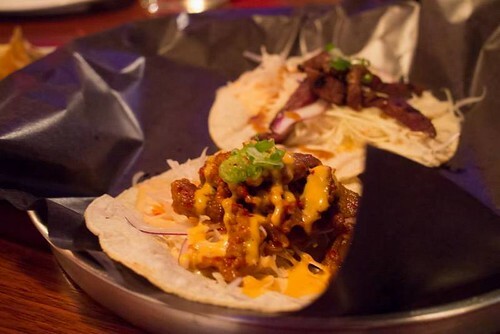 Each person was treated to two different tacos, the Kalbi Taco and the Spicy Pork Taco. After finishing these, I was a quarter full already. These tacos, although already adjusted to be small, were quite filling! 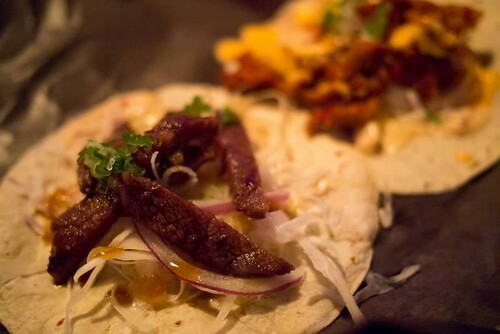 The Kalbi Taco contained grilled kalbi on a bed of shredded cabbage with red onions and a light house aioli. I really didn’t like the tortilla since I thought it was cold and a little too hard. The kalbi itself was a little tough as well and didn’t go very well together with the rest of the taco. On the other hand, the Spicy Pork Taco was delicious. Both tacos had abundant house aioli sauce that dripped out the other end as you ate it from your hand. The spiciness of the pork was just enough; not too spicy. I liked this one! Next up were the Chili Shrimp. These were so cute! 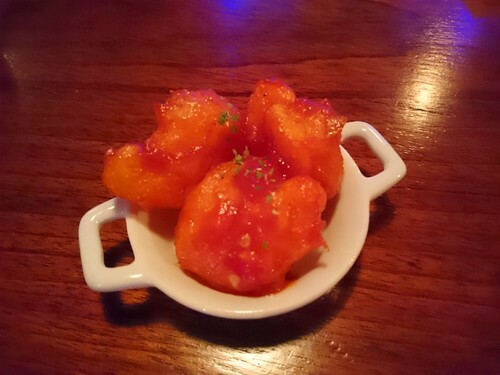 They were separated into four portions already where there were 3-4 pieces of lightly battered shrimp dipped in a sweet chili sauce in a little dish. 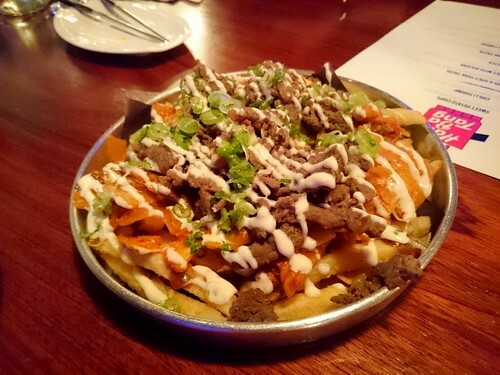 This tapa was very average for me. We thought that the batter shell of the shrimp was a little too thick and hard. I would have liked it more if the shrimp was more crunchy and fresh too. Out of everything that we tried that night, this one was the most average and forgettable dish. After the shrimp, we received a flight of soju to our table. We were able to choose the flavours. We got the apple cinnamon, pineapple, cucumber, and citron soju. They actually have the jars of each infused soju displayed nicely in their restaurant which we took pictures of. To my surprise, apple cinnamon was the best soju flavour. I usually am not a fan of any type of cinnamon but this made the soju taste a little sweet yet had a light punch to it. The cucumber one was refreshing, and the pineapple and citron one tasted exactly as you would expect. I would definitely have the apple cinnamon soju again in the future! 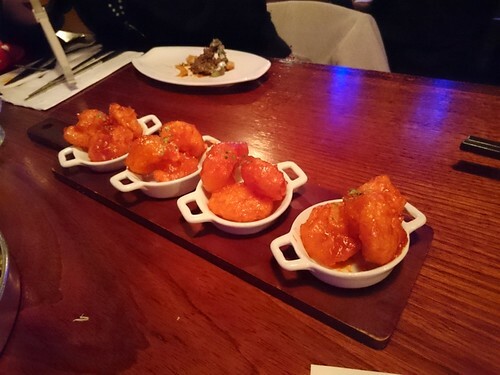 After we received our soju flight, we tasted the heaviest tapas of the night. The Black Squid Ink Pasta was a surely different dish. I’m sure most people haven’t tried this before. For myself, I’ve had this on two other occasions now (see here). This dish was fancy. 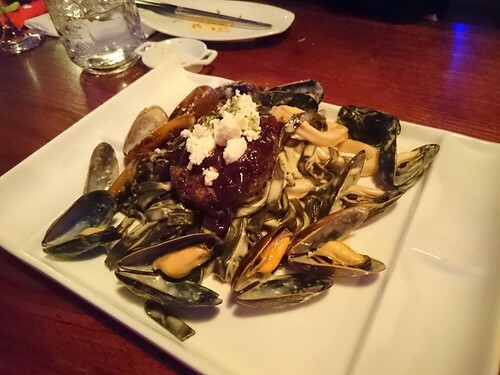 It contained squid ink pasta mussels with a housemade gochujang cream sauce topped with a Korean beef cake and cheese. I really enjoyed the mussels. The mussel was so soft! Yum! The squid ink pasta was black as expected and covered in the delicious cream sauce. The Korean beef cake was firm and meaty. 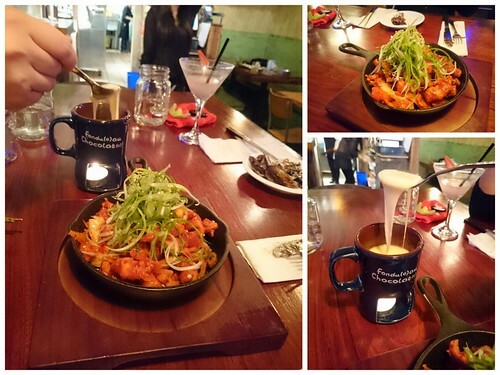 The Spicy Chicken with Fondue was much loved. When you put chicken together with fondue/cheese, that’s when I am most happy. 😀 The grilled chicken on a sizzling plate with rice cakes, onions, and carrots was nothing too out of the ordinary (the grilled chicken itself was delicious, however, and so were the rice cakes — so soft and chewy! The chicken was a perfect level of spicy as well). The part that was special about this dish was that a mug of creamy cheese fondue was served on the side. 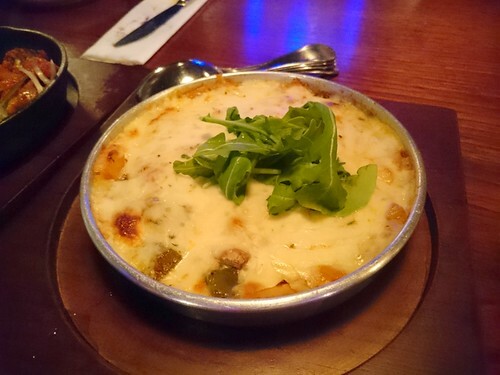 The container that it arrived in was cute; there was a small candle underneath the cheese that continued to heat it up. Dipping the chicken into the cheese was delicious and fun! The Spoon Pizza was my favourite dish of the night. This dish is to be eaten exactly as its name indicates — you eat the pizza with a spoon! This is a dough-less pizza. Mashed sweet potatoes are the “crust” with vegetables and tomato sauce is topped off with cheese and kimchi in this case. It was so yummy. The cheese was chewy and the mashed potatoes with the kimchi made it a unique spooning experience. Yum! Last but not least (see how there were so many tapas? 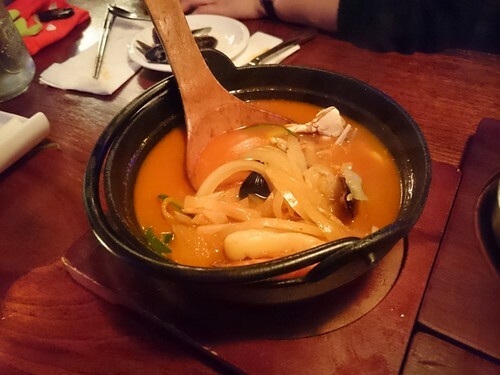 ), we tried the Spicy Seafood Soup. It arrived in a black pot with a big wooden ladle. At this point, I really was so full and couldn’t eat too much more. The soup was authentically infused with seafood and spicy. It is the perfect soup base to serve with ramen which is what they usually pair with, but because even the kitchen understood how much we were eating that night, they didn’t include ramen in it. Again, I appreciated their small details of giving out small bowls and spoons so that we could split up the soup to share and taste. The very, very last course of food was dessert. 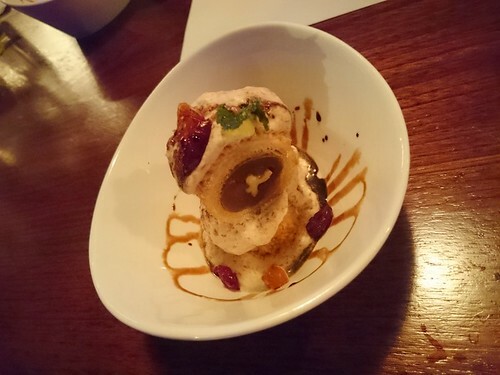 Now, the dessert name wasn’t included in the menu so I can’t express what exactly was in it. However, look at how cute it is. It looks like a little snowman. It was a delicious chunk wrapped up with a sweet foam. It was a good finish. We left that night feeling very full and very satisfied. 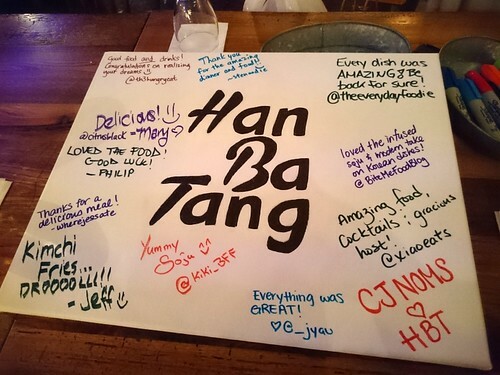 I left my mark on their Han Ba Tang board along with the other bloggers. We also took a polaroid shot to be later put up on their Christmas tree. How sweet! The owner again expressed her thanks at the end of the restaurant and brought out the chef to introduce us to as well. She said there will be more blogger preview events in the spring. I’m excited for that! 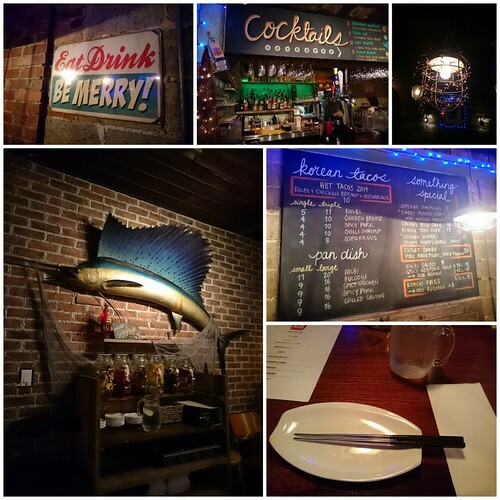 FTC Disclaimer: Although Han Ba Tang reached out and invited me to a complimentary tasting preview menu to review their restaurant, the opinions expressed here represent my own and not those of the restaurant. 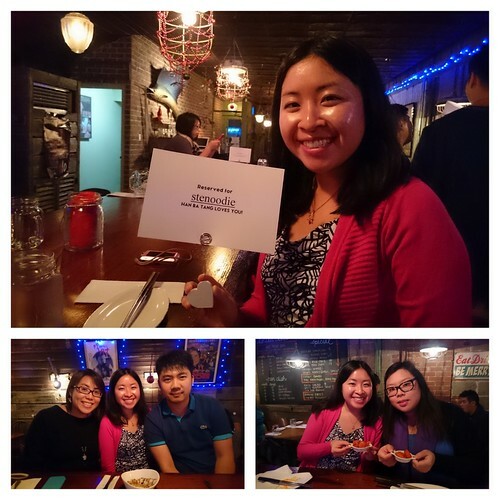 This entry was posted in Complimentary Adventures, Food and tagged "Live to 1000" Soju, 4862 Yonge Street, @hanbatang, @Han_Ba_Tang, Black Squid Ink Pasta, blogger media preview, bloggers, Chili Shrimp, event, food blog, foodie, fusion, ginseng soju, Han Ba Tang, Kalbi Taco, Kandy Crush, kimchi fries, Korean, media event, modern, North York, owner, Peach Beach, restaurant review, Soju, soju flights, Spicy Chicken with Fondue, Spicy Pork Taco, Spicy Seafood Soup, Spoon Pizza, Strawberry Inception, tapas, tasting, Toronto, Toronto bloggers, Yonge Street. Bookmark the permalink.